Family-friendly activities in the Outdoor News Wild Trails Kids Zone including a BB Gun range, and a trout pond. Be one of the first 30 kids to stop by the National Wild Turkey Foundation (NWTF) booth during the show – and you could get a FREE Owl Hooter locater call! They’ll be handing these out each day of the show. GOT YOUTH? 2019 DEER AND TURKEY CLASSIC AIMS TO ENTERTAIN ‘EM! Now in its third year, the Outdoor News Deer and Turkey Classic has several focal points: impressive antlers, top-notch seminars, and world-class hunting experts and celebrities. But one over-riding theme remains core to the event’s mission: Educating and entertaining the next generation of hunters. 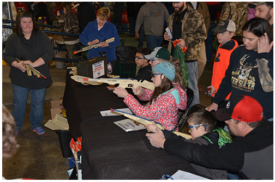 Youth hunters are the future of deer hunting and other outdoors sports, and the Deer and Turkey Classic has another impressive lineup in its Wild Trails Kid Zone for 2019. The 2019 event runs March 8-10 at the Warner Coliseum on the Minnesota State Fairgrounds. 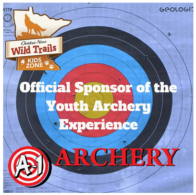 A1 Archery is sponsoring the Kids Archery Shoot, and staffers from the shop will be on hand giving first-time shooters a bow-and-arrow tutorial. 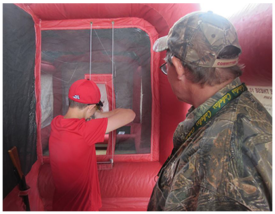 Under instructor supervision, youth shooters will have the opportunity to grab a lightweight bow and pop some balloons and take other short-range shots. A1 staffers will teach beginning archers how to distinguish if they have right or left eye dominance and just have fun. A1 usually has some hunting videos for kids on hand, too. The National Wild Turkey Federation is giving an owl hooter locater call to the first 30 kids who visit the organization’s booth each day of the show. The NWTF gang also will supervise a youth BB gun shoot where kids can test their shooting skills by plinking some targets. 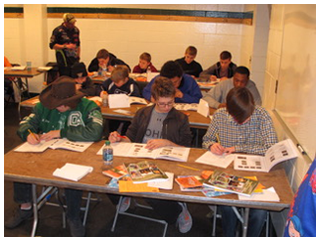 Pick up some information on NWTF’s youth program, Jake’s, while visiting. Across from the NWTF booth, kids and adults alike should check out the World Slam of Turkeys display to identify all six subspecies of North American wild turkeys. Pick up an information sheet on the natural history of these remarkable game birds, then take a quiz to test your learning. Turn-In-Poachers and the Minnesota DNR Enforcement Division will be on hand with an interactive laser-shot game. 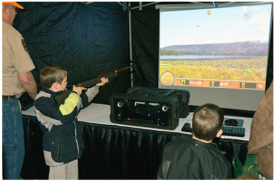 Kids can ask questions to state conservation officers and hunt some multi-species digital big game via laser rifle. Speaking of shooting, kids of all ages have enjoyed the rubberband shoot sponsored by the Boy Scouts of America. Fire up some rubber bands, test your skills, and make some noise clicking targets. 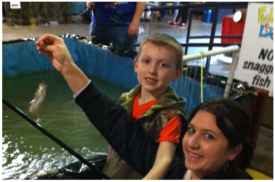 Aspiring pro anglers among young attendees should visit the trout pond, sponsored by Fishing For Life. On Friday, March 9 adjacent to the pond this year, KFAN iHeart Radio personalities Chris Hawkey and Paul “Meatsauce” Lambert will be on hand. While they’re meeting attendees, the first 15 youth who catch a tagged trout during each of their appearances will receive a new Rapala Ripstop lure. On Saturday, Rapala will offer the same promotion while Mike “Muss” Mussman from K102 Radio is on hand. Fishing for Life also will oversee a youth firearms safety class in a private room on site. Providing easy access to the class while kids can enjoy the show before or after is a priority for event organizers, and a few spots still remain for 2019. Visit fishingforlife.org for details. For going on eight years, Minnesota author Kevin Lovegreen has been piquing the curiosity of youth in hunting and the outdoors with his Animal Sound Challenge. 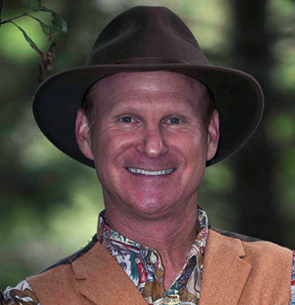 Author of the book series “Lucky Luke’s Hunting Adventures,” Lovegreen’s unique presentations have proven to fire kids up to read, write, and enjoy the outdoors. A simple concept, the Sound Challenge stumps children with an incredible variety of wildlife calls. Lovegreen uses many different calls to share varied sounds with kids, then asks them to identify the species and whether it’s male or female. Visit Lovegreen’s booth or check out his “World Famous” Animal Sound Challenge on Stage B during the show. A live animal exhibit featuring two gray wolves and a fisher has been popular at past shows and returns in 2019. Then youngsters can stump themselves at the Minnesota Deer Hunters Association booth where staffers will display an Animal Skull Identification Challenge. While there, kids should consider signing up for one of MDHA’s popular forkhorn camps during spring and summer 2019. Finally, Outdoor News plans to unveil a new initiative at the show this year: its Junior Pro team. Visit a special booth near the trout pond and wild animal display for complete details on this club for up-and-coming sporting youth. The South Concourse of facility will house booths and exhibits for the Wild Trails Kids Zone. Outdoor News is looking forward to a great turnout for these free activities again this year. Friday, March 8 from 1 to 9 p.m.
Saturday, March 9 from 9 a.m. to 7 p.m.
Sunday, March 10 from 10 a.m. to 5 p.m.
During our special promotion on Friday and Saturday, stop by the trout pond sponsored by Fishing For Life and Insurance Brokers of Minnesota. The first 15 kids who land a tagged fish while our radio celebrities from KFAN and K102 are there, will win the new clown-colored Rip Stop Lure from Rapala! Fishing for Life will host a youth firearms safety class in a private room on site. Providing easy access to the class while kids can enjoy the show before or after is a priority for the organization. Visit fishingforlife.org for details on a few of the available spots still remaining for this class. A-1 Archery is proud to offer introductory archery at the Minnesota Outdoor News Deer & Turkey Classic! Instructors will give a hands on experience shooting a bow at a target and learning proper form and technique. We will teach archers how to distinguish if an archer has right or left eye dominance and have a ton of fun! Join us for a great time! We’ll also have an interactive and educational opportunity for kids to take a quiz focused on identifying the “world slam” of wild turkeys, as well as identifying furs and skulls from various animals.